U1075-PB-PK is rated 3.5 out of 5 by 6. Rated 1 out of 5 by diy47 from Not Universal Read the instructions on installing this onto a 1/2" slip-fit copper pipe. Really? Cut the piece so that it fits? I just threw this in the trash so noone else has to try to work with this and went to Home Depot for a fixture that I know works. Rated 1 out of 5 by happyplumber from Beware! This is chromed PLASTIC...very cheap. We replaced our metal spout with this cheap plastic one. This faucet broke off after 11 months of normal use. It is advertised as being brass material. They have cheapened the material to the point that it will not hold up to any normal expectations. 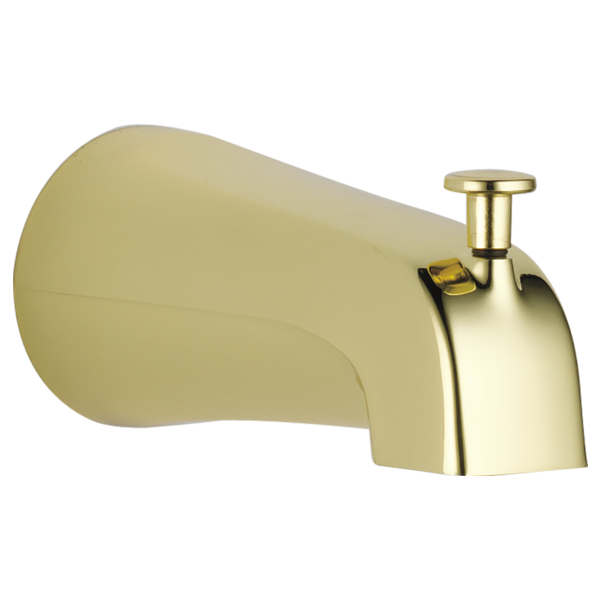 Rated 5 out of 5 by Kugrpa from Wonderfull product The faucet was easy to install and works exactly as described. Rated 5 out of 5 by Mikit8183 from Just what I was looking for! My existing tub spout was not operating properly. This replacement spout brought us back to when all was newly installed. Is there a tub spout diverter that will fit into a 2 1/2 inch length pipe and is threaded at the end. My present 30 yr old delta polished brass spout is pitted and will only partially divert. The present tub spout I have is threaded at the rear also if that makes a difference. What size allen wrench does the set screw require? Is this spout all metal, or is it chromed plastic? I'm looking for a diverter tub spout with 4-inch spout reach and screw-on. Do you have anything fitting that? I need a spout that will screw on to a 3/4&quot; diameter stub that extends 3/4&quot; from the wall. Will spout u1075-pk screw on flush to the wall? Most spouts seem made only to handle a stub that extends 1/2&quot; from the wall, so I'm having trouble finding one that will screw on without leaving a 1/4&quot; gap. Thanks for any help. I might also be interested in spout u1011-pk, so I would have the same question about that one. Does this spout require caulking around its base?